Bank holiday weekends are perfect for taking your time over food – for loved ones, and for yourself. 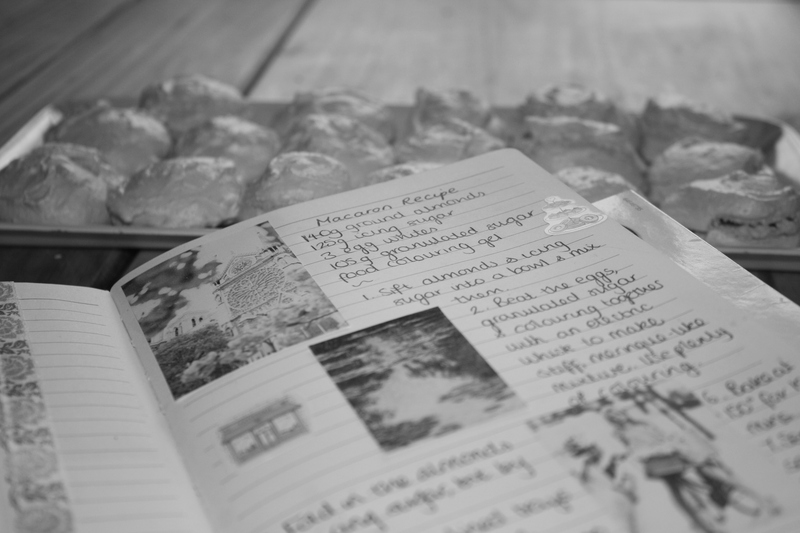 Here are a few recipes you may like to try, each one being something I’ve really enjoyed myself. I love a slow, easygoing brunch after a lie in, sipping coffee while reading or talking and tucking in to something home-cooked. 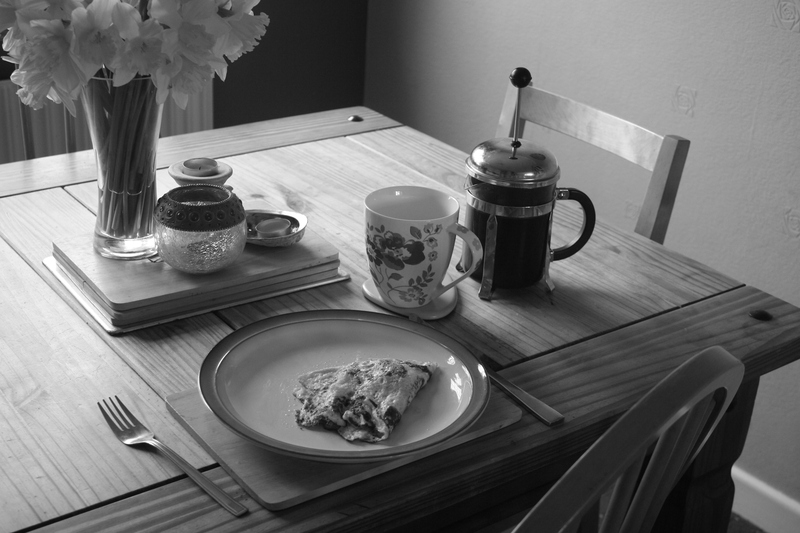 The omelette featured first furnished me with just such a morning the other day. Although I have liked baking for a while, I’m quite new to making desserts so tend to prefer to keep them simple. 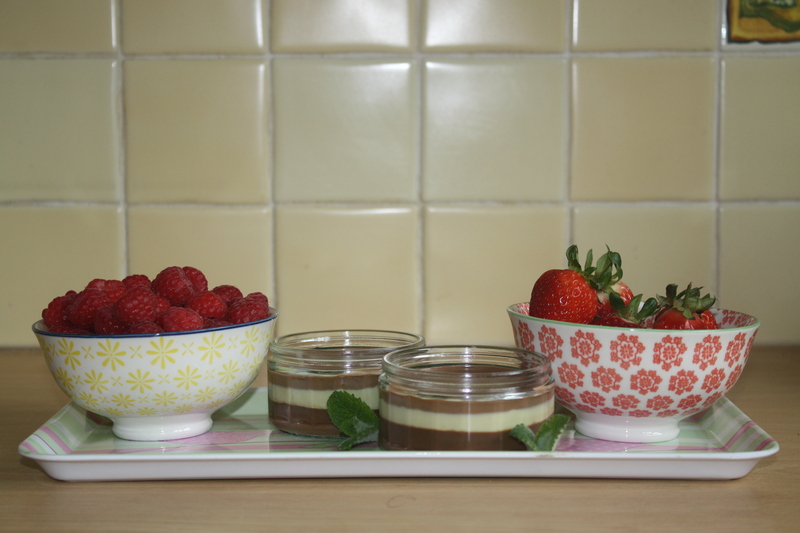 The chocolate pots below are the perfect end to a family meal and are very cheap and simple to make. I have yet to find anyone who dislikes them! You’ll have leftover egg whites from that recipe, so why not try out some macarons and give them away as Easter gifts? 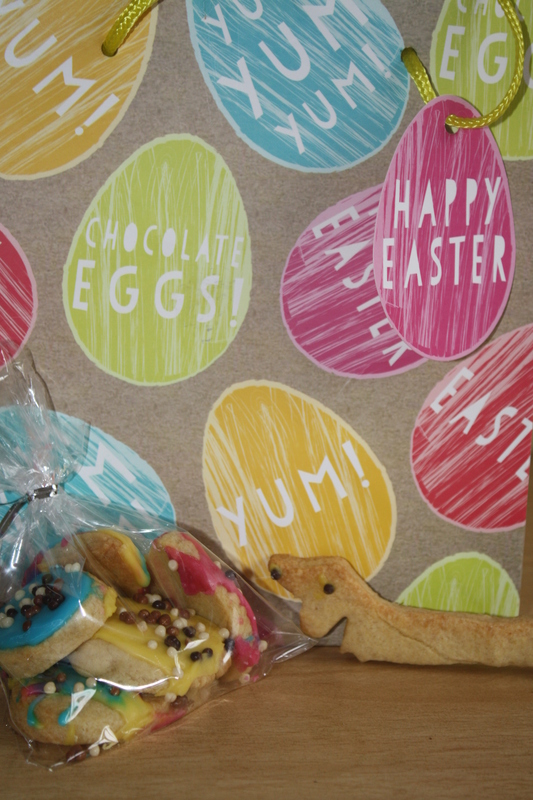 Or, for a more straightforward Easter giveaway, the biscuit recipe is simple and delicious, and fun to decorate with children. They’re also a nice accompaniment to tea or coffee when you’re entertaining Bank Holiday visitors. The perfect bank holiday brunch. Great with coffee. Serves 1. 1. Beat the egg with milk and seasoning whilst you heat a small amount of oil in a frying pan. 2. Pour the egg mixture into the hot pan. In a normal sized frying pan, this recipe should cover half the pan, and you’ll need to use your spatula to keep your omelette to one side. Also using the spatula, push the edges in every so often, so that the uncooked runnier mixture falls into the edge making sure that the whole omelette is cooked through. 3. Add the feta, ham and tomatoes on top of one side of the omelette. 4. As the feta starts to soften, fold over the omelette using a spatula. 5. Turn the heat off and let the omelette cook for a little longer so that the cheese continues to melt and the tomatoes soften. If you would like a bigger portion, make with 2 eggs and allow to cover the whole pan, and use slightly more feta, ham and tomatoes. The feta in this recipe will not melt completely like a cheddar or other cheese would do. If you like your feta completely melted, give the omelette a zap in the microwave to avoid burning the bottom of the omelette! The perfect chocolatey dessert. Great served with raspberries or strawberries. Serves 4-6 people. 1. Place 150ml cream into a pan and heat gently. 2. As the cream heats up, add the dark chocolate and stir in until melted. 3.Incorporate 1 egg yolk and 10g butter. 4. Once the mixture is blended well, pour out into ramekins, leaving enough space for two more layers. After allowing the chocolate to cool a little, place the ramekins in the fridge to allow it to set. 5. Repeat instructions 1-3, this time adding your white chocolate instead of the dark chocolate. Pour the mixture into a jug to allow it to cool a little. 6. Once it is a little cooler, and the first layer sufficiently set, pour a white chocolate layer into each ramekin. 7. Repeat instructions 1-3 again, this time with the milk chocolate, and when done add to a jug as in instruction 5. 8. When the 2nd layer is set, pour on the milk chocolate layer and return the ramekins to the fridge. Note: It is so easy to buy Fair Trade chocolate these days, and by doing so you are ensuring that no children or slaves have been forced to work in the making of it, and that those who did help to grow and produce it got a fairer wage. Most supermarkets own brand chocolate is now Fair Trade or Rainforest Alliance, so do try to go for these if you can. Also, save any chunks or leftover chocolate and serve to your guests with coffee! A sweet treat that looks a little bit fancy but is actually fairly simple to make. These look great in the pastel colours of Easter time and would make a great Easter gift. 1. Sift the almonds and icing sugar into a bowl and mix them. Putting the almonds through the sieve is pretty laborious but persevere! It doesn’t matter if you lose a small amount. 2. Beat the eggs, granulated sugar and colouring together using an electric whisk to make a stiff, meringue-like mixture. Be generous with the colouring as when you add the icing sugar etc it does pale a little. 3. Fold in the almonds and icing sugar bit by bit. 4. Spoon or pipe onto lined trays making sure the macarons are not too big, all roughly the same size, and not too peaked. 5. Leave at room temp for about 15 minutes. The macarons should go slightly harder. 6. Bake at 150 degrees for about 15 minutes. 8. Serve sandwiched together with raspberry jam in the middle. A simple Easter gift. Make as egg shapes and decorate with bright icing, or keep them simple and sophisticated with drizzles of dark chocolate. Makes approx 24 biscuits. 3. Sift in the flour and spices (add the spices to taste – I like a generous helping, about 1 heaped teaspoon). 4. Bring together to form a dough. I find it easiest to start with a metal spoon and then pour out onto a floured surface and finish bringing it together with floured hands. 5. Roll out the dough to about 1/2 an inch in thickness and cut into the desired shapes. 6. Place on a baking tray and bake for 13-15 minutes.